Rewind the clock about two years. The scene of the incident is an apartment located just north of Atlanta, Ga. sometime in the night. Mr. K is staying with a friend while Scottie Mom is away for a few days. He is snoozing peacefully on the sofa when suddenly, he hears keys jiggling at the door. Mr. K's ears perk up. Scottie Mom's friend enters the apartment, with a strange man in tow. Who is he and what is he doing in my temporary home, says Mr. K, as he jumps up to investigate and question this man. He passes through Scottie security with a warning. Mr. K returns to his seat, watching the strange man carefully. Scottie Mom's friend and the strange man proceed to the kitchen laughing. They each grab a drink, chat for a few minutes and soon head to the bedroom. Finally, Mr. K thinks to himself, it's bedtime. Wait a minute. Scottie Mom's friend didn't call him in to sleep. How could she have left her snuggle bud behind? After all, is it not he who keeps her feet warm at night? The door's open and everything's quiet. She must have forgotten. Mr. K shrugs it off, stands up and stretches, about to make his way to join Scottie Mom's friend for a good night's sleep when he hears something coming from her room. It's the strange man. And some dreadful creaking. 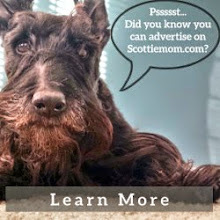 Oh no, Mr. K says, that strange man will NOT terrorize any of Scottie Mom's friends. Like a brave soldier, he takes off in a moment's notice and rushes to save the damsel in...err, distress. Running full speed ahead, Mr. K enters the bedroom yelling, "Aarf, arrf, aarf, arrf, AARFFF!" 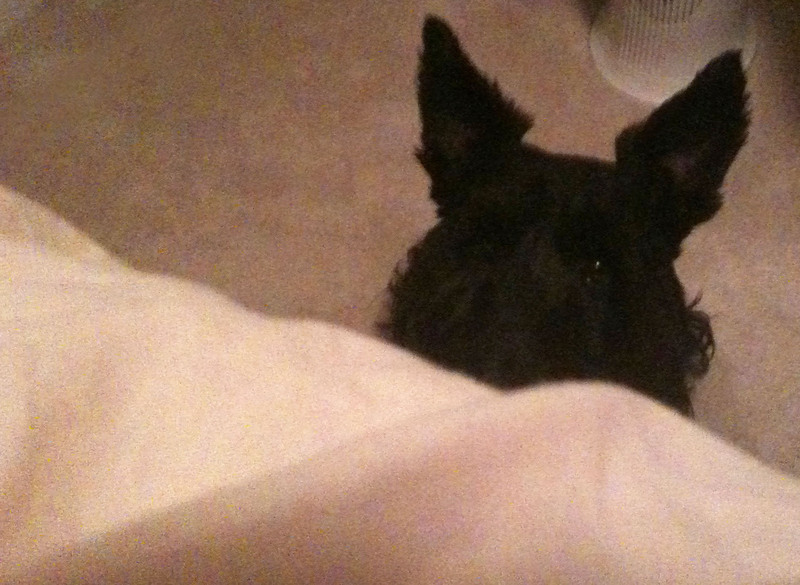 He dashes from one side of the bed to the other, desperate to find a way up and help his Scottie Mom's poor friend. He wonders why she has not acknowledged his presence and valiant efforts to save her when he realizes she is too hurt to move. The strange man is immobilizing her! Mr. K has to do more. He takes a few steps back, still yelling at the strange man to stop and charges as fast as he can before he makes a giant leap. For a brief second in time, everything stops. Scottie Mom's friend and the strange man look at Mr. K, who is glaring at the strange man with cold, unforgiving eyes from atop the bed. Then, as quick as it stopped, time started up and Mr. K pounces on his enemy when, in mid-air, he is scooped up and escorted out the bedroom door in a flash. By the time he turns around, Mr. K finds the door has been shut behind him. Oh noooo, says Mr. K, I have failed! The strange, evil man has locked me out of the bedroom and I MUST find a way in to protect Scottie Mom's friend. SCRATCH, SCRATCH, SCRATCH. Aarf, arrf, AARFFFF! Why does this door not budge? That strange man has entered the home of a dear friend who Scottie Mom left me to protect. She said nothing about a strange man coming. 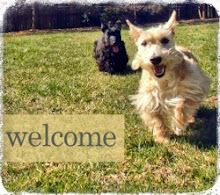 How dare he enter this temporary home and disrespect Scottie Mom's friend in such a way? Mr. K says to himself, "I'll teach him a lesson..." and darts off to find any trace the strange man left of himself around the apartment and pees on every trace he finds. "That'll show him who's house he's in," says Mr. K.
After his vigilante work is complete, Mr. K settles by the bedroom door to await the strange man's reappearance. His eyes are about to close when he hears movement from behind the closed door. Ears perked up, Mr. K sits up presently, waiting for the moment when the door will be reopened. When it finally does, Scottie Mom's friend isn't upset with the strange man and actually emerges with a smile...that is, until she sees Mr. K's artwork around the apartment. She escorts the strange man out of the apartment before Mr. K has a chance to attack and begins to clean up the mess. Mr. K sits by her side, smiling and feeling confident now that his temporary territory has been marked, the strange man will never dare to re-enter this apartment with such blatant disrespect. Mission: accomplished. Or, so he thought. Turns out, that strange man did visit a few more times but only once more while Mr. K was visiting. And that time, the bedroom door remained closed from the time he entered. Mr. K clearly was not happy with this arrangement as his antics were similar to the aforementioned incident but, in due time, the strange man left that apartment for good - never to return. The important lesson for Scottie Mom's friend was that if Mr. K doesn't like your "friend," there's probably a reason for it and you best drop that strange man as quick as you found him. These days, this same friend of Scottie Mom's has embarked on a new relationship with a promising future...albeit that cannot be said for sure, since Mr. K has not been called in for final judgement. I can just see Mr. K's glaring eyes--frozen in mid air, omg...laughing too hard to finish my thought!!!!!!! Oh my!! That is a great story! Good work Mr. K! That was too darn funny! I can just picture this happening, and I sat smiling and had a little giggle! You go Mr. K., and just love the picture! Laughed myself into a trance! Very cute story, but I am not surprised that Mr. K would react in such a way - he is, after all, doing his job as protector following his Scottie instincts. However, if it was me who was 'Mr. K sitting' while Scottie Mom is out of town I would have postponed having company and instead try to provide the same quiet, no surprises sleeping arrangements Mr. K is accustomed to having while away from home, Mom and everything familiar to him! Hysterical....and too true. I have a similar story...and you're right. Dogs do know when someone is good .....and when you should raise your hackles.